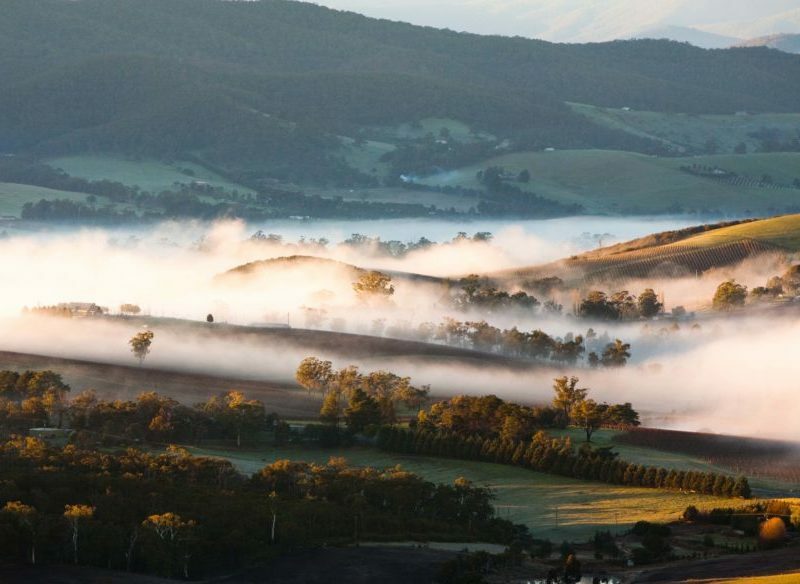 The Yarra Valley is home to some of the best boutique wineries in Victoria. That’s no secret. Here, we explore the famously verdant valley, bringing you all the secrets of its overlooked fringe. Long before it becomes Melbourne’s infamous upside-down brown muddy waterway, a clearer and more compact Yarra River meanders through a gentle landscape. Here the lush green flatlands give way to a big sky and the soil is deep chocolate brown and almost obscenely fertile. Cellar door and Black Paddock Restaurant open daily, 11-5pm Mon-Fri, 8-6pm Sat & Sun. Try the Merlot or the Pinot Noir. (03) 9437 2155. This is a wedge of land roughly bordered by Healesville, Lilydale and Yarra Glen. It’s within these bounds that wine-lovers flock in their thousands, attracted by verdant vineyards, world-class restaurants, dramatic conference and wedding venues, cosy B&Bs – and roughly 40 of the region’s 55 wineries. So, is it this heart of the Yarra that our story is all about? Experience the valley’s centre by all means, but leave enough time for the undeniable charms of the fringes, those pockets of vines around Seville to the south and Panton Hill to the west. On the edges you won’t experience the imposing steel and glass edifices filled with bus tour visitors. Instead, savour a world of rustic wood, stone or mud brick buildings set amid eucalypts or oaks. Little streams bisect the hilly, rocky landscape and afternoon shadows arrive early. The kangaroos and kookaburras and goannas seem to like it up here better than down on the valley floor. Maybe you will, too. An hour out of Melbourne, just past Lilydale, the road splits. Most travellers go left, up along the Maroondah and Melba highways to the valley’s popular heartland. But you’re going to turn right, along the Warburton Highway to Seville, where you can eat, drink, sleep and explore in absolute unhurried bliss. Number one by the alphabet (and in my affections) is Ainsworth Estate, literally three minutes from the main road down quaintly named Ducks Lane. Sunday lunch on a spring afternoon is the sort of treat you promise friends who’ve come to see you from Perth or Hobart. You can stay here, too, in stylish new multi-level apartments designed for privacy and for taking full advantage of the magnificent views southwards towards the looming Dandenongs. Wildly romantic. Fancy a picnic and a shady spot to sample that newly purchased Cab Sav? Seville Estate is the place. Huge old gum trees lord over the soft grass paddocks, each with its own view down to the gullies below. This is one of the oldest wineries in the district, boasting vines that produce the most luscious of fruit. Talk jazz with the owners anytime – they love and support swinging music. Next door to each other just minutes down the old Monbulk Rd are Five Oaks Vineyard and Elmswood Estate. The former lives up to its name. Ex-Canadians Judy and Wally Zuk bought the vineyard and winery in 1995 and renamed it after the five magnificent and massive oak trees that grace the property. The rich, red volcanic soil produces extraordinary depth and complexity of flavour in the wines. And if you tire of wine talk, you can always change the topic to ice hockey or curling. Elmswood boasts perhaps the most thrilling views of any winery in the Valley. Sit in their English-style cottage garden sipping the very good Chardonnay and glance across the vines to Mt Donna Buang and the forested hills above Warburton. Needless to say, weddings and lavish birthday bashes are very big business for these folks. Just below Seville East is the McWilliams Lillydale property, a vast vineyard similarly blessed with dramatic views from the terrace. They do an extremely popular indoor BBQ here, or you can wander out to the pergola for a more intimate moment with your beloved. Evelyn Country Estate sounds like something from the English novels you were forced to read in high school. In fact, it’s one of those “everything’s right here” sort of places – medal-winning vintages, accommodation, elegant restaurant, even an art gallery featuring the works of watercolourist Tony Smibert. It’s on the main road just out of Kangaroo Ground, and on a summer evening after 7pm or so, the locals are out in force, grazing. The stone villas of Tuscany provided inspiration for Panton Hill Winery, where the sparkling wines take pride of place alongside some lovely Merlots and Cab Savs. Solid rock keeps things cool in summer but toasty in winter, thanks to a huge open fireplace. In-the-know Melburnians savour the beautiful Mediterranean courtyard with vineyard and bush views. Here the roads meander northward through dry hills and tiny tree-lined creeks, bringing you to. Lovegrove Winery, with its unique mud-brick tasting room, cool courtyard and art gallery. “Our wines are made from small crops of premium fruit, utilising traditional techniques thus providing immense flavour and power, preserving the unique vineyard character,” the man behind the counter tells me. I believe him. The Wedgetail Estate winemaking style is a fusion of centuries-old Burgundy tradition, the new Australian reverence for grape quality and winemaker Guy Lamothe’s individual flair. Perfect with the nice big platter they do for lunch. Check out the stylish rammed-earth main building. Nearby, discover the village of St Andrews and its remarkably attractive Saturday morning market. Nothing tacky or silly here, just delights ranging from locally produced honey and veggies, to unique jewellery and clothing. The bloke selling candles always does a good trade, too. This market isn’t very well publicised, so a lot of visitors tend to miss it. Rather like the Yarra Valley bookends, I reckon. BEYOND those we’ve already mentioned, there are at least a dozen more wineries open only by appointment. They’re not listed here but details can be found at the excellent Yarra Valley Winegrowers Association website, www.wineyarravalley.com.